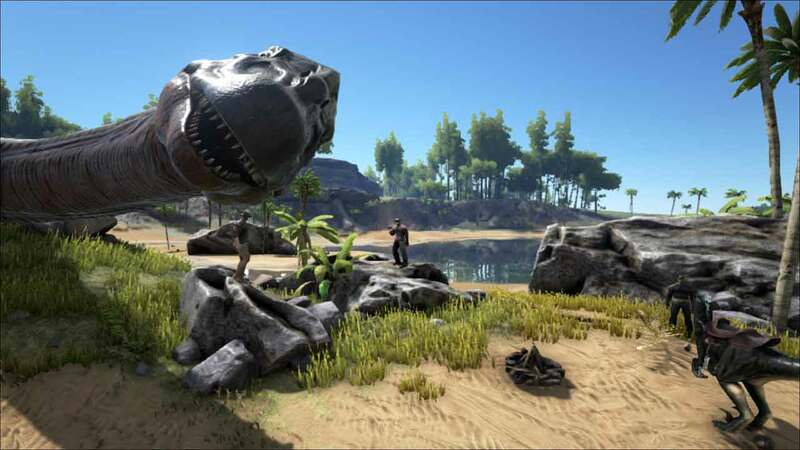 The skies of ARK: Survival Evolved are under aerial assault today as the studio that never sleeps, Studio Wildcard, announced the release of their latest update featuring a brand new dinosaur alongside an array of other exciting features including the highly anticipated Grappling Hook. The brand new Terror Bird, or the Phorusrhacidae Rapidesultor (bonus points if you can pronounce that correctly), stands at 12 feet tall and is an aggressive but tamable and ridable creature of the skies that acts as the perfect combat mount for the players of ARK: Survival Evolved. The game-changing Grappling Hook also makes its debut, offering survivors the opportunity the scale the highest cliffs and even attach to dinosaurs for an aerial view of the island. Additionally the Grappling Hook can also be used to wrangle other players or even smaller dinosaurs. Finally new upgrades to fishing, Tribe Alliances in PvP and crowd-source translation tools have also been added.